Teaching was a lot different when I first started 16 years ago. Overhead projectors and Vis-a-Vis markers were all the rage. Books on CD were considered “high tech.” Most classrooms had just a handful of desktop PCs (and figuring out how to get the best use of them was a constant headache). Pinterest wasn’t even imagined yet. The concept of being a “connected educator” was only in its infancy thanks to a few message board websites. Fast forward to 2018, and it’s the norm to find educators collaborating in Facebook groups, participating in online chats, sharing activities on blogs, and more. For me, one particular medium has proven most beneficial: Twitter. In fact, I can proudly say that it has truly changed my life – both professionally and personally. While this may sound a bit over the top, I assure you that it is true. Twitter and I first met back in 2010. At first, I found it incredibly confusing to navigate. It wasn’t until several years later that I gave it another go to only discover its power, and from then on, I was hooked! While meant to be used as a social media platform, Twitter is actually a high impact form of professional development for educators. Because it is free to use and much more user-friendly these days, teachers can easily access it. This has led to great things. On any day of the week, you can find posts about the latest kid books to hit the shelves, threads about classroom management techniques, and scheduled chats for professional book clubs. There are videos of teachers sharing ideas for lessons. Links to discussion guides and extension material for novels. Authors posting giveaways for ARCs of upcoming books. Groups of educators organizing in-person events like nErD Camp or Ed Camps. I could go on and on, but one thing should be very clear: you cannot afford to be disconnected from this platform. In my time as a connected educator, I have gained more than any workshop, conference, or summit. This includes communicating with teachers and administrators from around the world, participating in Twitter chats, making connections with nearby teachers, and learning about – as well as helping to organize – events for us to grow as professionals. I have formed personal relationships with authors of books my students adore and subsequently leveraged that to help excite kids about reading. I schedule Skype sessions almost monthly. Our latest was with four authors who told us about their spooky middle grade novels: Kat Shepherd – Babysitting Nightmares; Jonathan Rosen – Night of the Living Cuddle Bunnies; Kim Ventrella – Skeleton Tree; and Samantha Clarke – The Boy, the Boat, and the Beast. Authors send us encouraging letters, bookmarks, and even additions to our class library; some even stop by for a visit!! 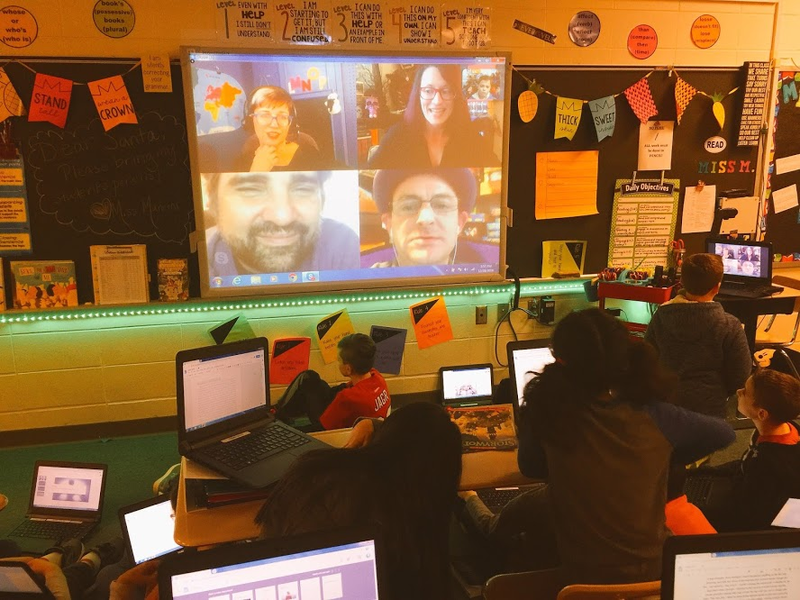 Most recently, Sally J. Pla, who wrote The Someday Birds and Stanley Will Probably Be Fine, and Rob Vlock, author of the Sven Carter series, took time out of their busy schedules to host a collaborative writing session with my class. They used the exact prompt the students were working with in order to demonstrate the writing process – live! The kids participated by adding details to the plot as well as helping with revisions. It was an amazing experience for all. Sally was also able to stay for just a bit longer to lead a storytime session with our first grade classes using her new picture book, Benji, the Bad Day, and Me. A few weeks later, Jarrett Lerner, who created the Enginerds series, spent the morning with us to discuss thinking outside of the box when writing. This led to even more amazing pieces of written by my students. Thanks to online connections, authors have also been more than happy to give feedback to students about their own writing and techniques to use. Elly Swartz, author of three middle grade books: Finding Perfect, Smart Cookie, and the upcoming Give and Take, even dedicated a section of her website to house videos about writing tips. Lindsay Currie, who wrote The Peculiar Incident on Shady Street, has also done this and is even using her videos to respond to common reader questions. While learning about point of view and perspective, Rob Vlock’s videos became the focus point for my lessons. His included writing exercises that were perfect for practice and helped my students when analyzing various texts. These experiences and others have all led to my forming a Future Authors Club for our school which has given serious student writers a haven producing the creative word. At our last meeting, the children met authors Sarah Cannon, Oddity; David Neilsen, Playground of Doom; Jonathan Rosen; and Kim Ventrella. After a discussion about their books and techniques, several students read their stories to them and received valuable feedback. It was a time we all will never forget. Based on the above, one thing is very clear: Twitter has changed how I operate my classroom and has completely revitalized my teaching career. Sure, I may have continued on as I had before becoming connected, but would I have made such an impact? Most definitely not. My classroom is a world centered around reading and writing; the key to that has been the author relationships I have formed on Twitter. Each day, students ask me if I talked to the author of this novel or if we received any mail from another. 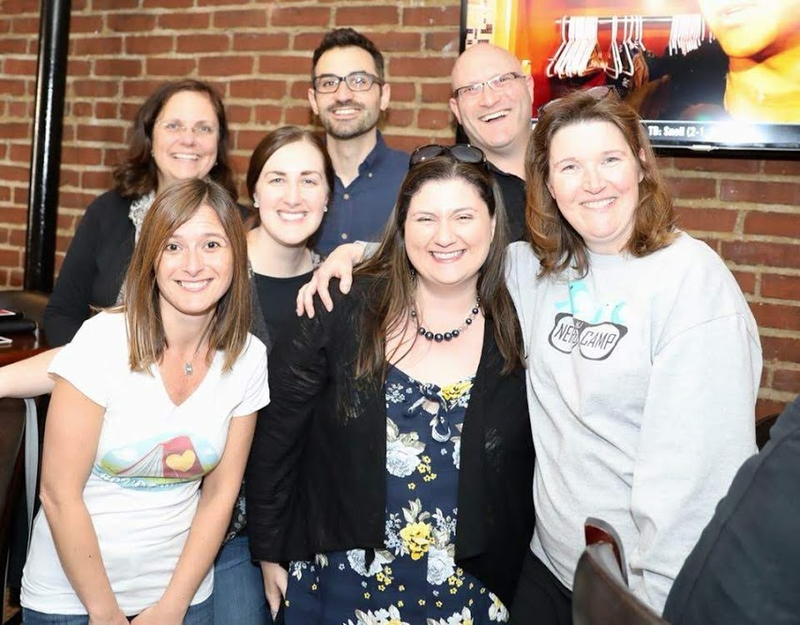 They make that real world connection when they see pictures of me with authors at events, eagerly ask who we will Skype with next, and beg for me to spread their thoughts about books to writers from around the country. If I struggle to match a book to a reader, composing a five second tweet yields dozens of results. The possibilities are absolutely endless. Reading engagement is at an all-time high. We live, breathe, and love books. Without my forming relationships with educators and authors on Twitter, none of this would ever be possible. I may have never taken the leap to take risks, revamp my curriculum, and push against the status quo. My love for reading has been reignited, and I excitedly pass that onto my students. The connections I have made have truly given me a “leg up” in this demanding and sometimes frustrating field. It has helped me realize that my vision for what a literacy classroom should look like can come to fruition. And for that, I am forever grateful. Nicole Mancini teaches fifth grade English Language Arts at Bedminster Township School District. She graduated Washington College in 2002 as a triple major in English, education, and gender studies and earned a Masters of Science in Education; she has a Reading Specialist degree from Monmouth University. Nicole has served as a member of Bedminster Township School’s Gifted & Talented Advisory Council, Technology Committee, Teacher of the Year Committee, and English & Language Arts Literacy Curriculum Committee. Nicole has presented various workshops on technology, reading instruction, and engagement. She has also led the faculty’s professional book club for the district. In addition to teaching, Nicole is a freelance writer, a member of the International Literacy Association, an ambassador for Flipgrid, and someone who enjoys staying current on the latest trends in the field of children’s literature. Loved your blog! I love Twitter for education- even as a lurker! Lol I love it for the latest research and the author connections. You’ve inspired me to get more involved with Twitter- instead of just lurking! Thanks! I really enjoyed reading your post. I have found the same to be true of the Bookstagram community on Instagram. I’ve learned about so many books I might never have known about, as well as formed some special relationships with readers and authors. Social Media can definitely be a great thing! THIS WAS quite informative. I’d never heard of FlipGrid before! Great post, Nicole! I find twitter extraordinarily helpful for me as a #kidlit writer. Your students are lucky to have such a passionate connected teacher like yourself! FlipGrid is new to me, too. Could Nicole tell us if there is a YA page of short videos like the one she posted for middle grade? Thanks! Thank you for sharing. I never knew Twitter could be used in some of the ways you do. I love Twitter, but admittedly need to be better at it! Thanks for the post – this was great!